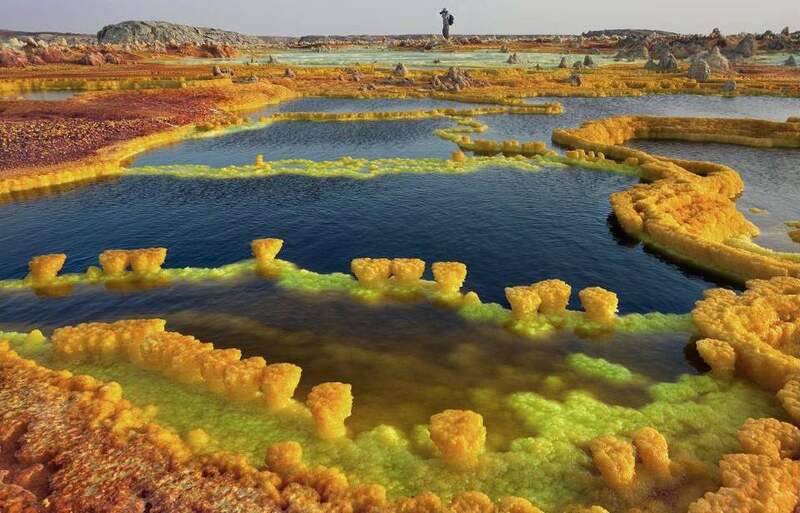 The alien-like landscape of the Ethiopian Dallol. Dallol is a volcanic explosion crater (or maar) in the Danakil Depression, northeast of the Erta Ale Range in Ethiopia. In 1926, massive Phreatic eruptions(1) took place here in 1926, forming Dallol Volcano, numerous other eruption craters dot the salt flats nearby. These craters are the lowest known subaerial volcanic vents in the world, at over 45 m (150 ft) below sea level. Numerous hot springs are discharging brine and acidic liquid here. Widespread are small, temporary geysers which are forming cones of salt. The area resembles the hot springs areas of the famous Yellowstone Park. Kelimutu Tri Colored Lakes Flores Island Indonesia. 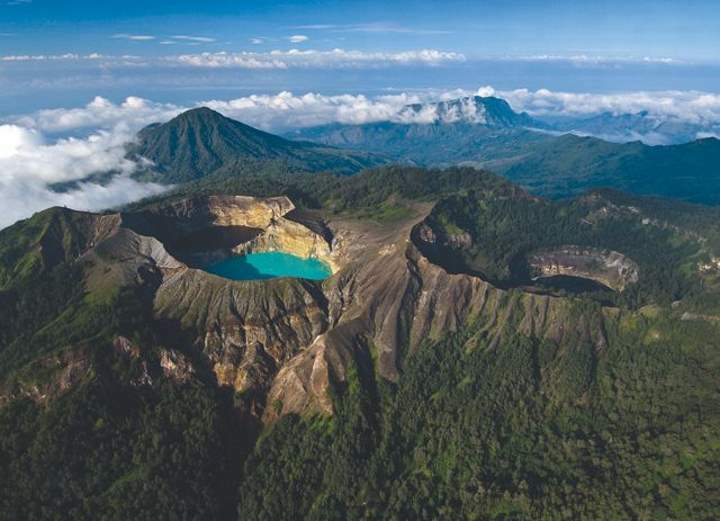 Kelimutu is also of interest to geologists because the three lakes have different colors yet are at the crest of the same volcano. Kelimutu is a volcano, close to the small town of Moni in central Flores island in Indonesia. 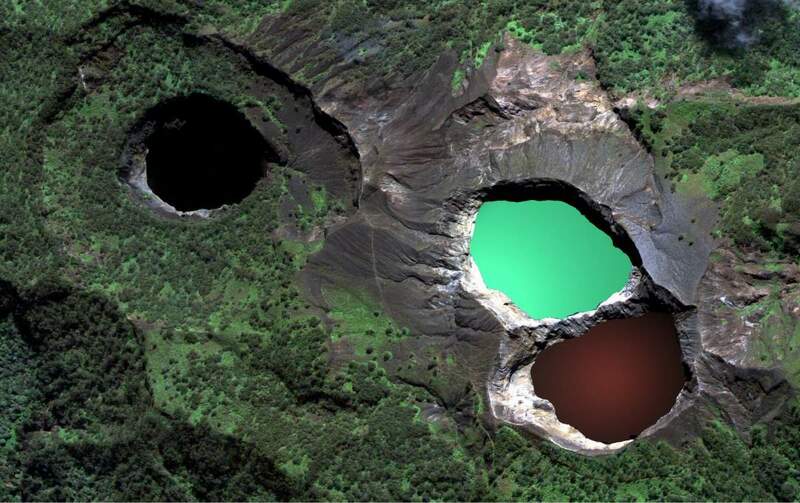 The volcano contains three striking summit crater lakes of varying colors. Tiwu Ata Bupu (Lake of Old People) is usually blue and is the westernmost of the three lakes. The other two lakes, Tiwu Ko’o Fai Nuwa Muri (Lake of Young Men and Maidens) and Tiwu Ata Polo (Bewitched or Enchanted Lake) are separated by a shared crater wall and are typically green or brown/red respectively. The lake colors vary on a periodic basis. Subaqueous fumaroles are the probable cause of active upwelling that occurs at the two eastern lakes. According to the local office at Kelimutu National Park, the color changes as a result of chemical reactions resulting from the minerals contained in the lake perhaps triggered by volcano gas activity. Kawah Putih lake in West Java, south of Bandung, is another crater lake in Indonesia with some similarities to the lakes at Kelimutu. The lakes appear to have different colors that change over time due to volcanic activity. 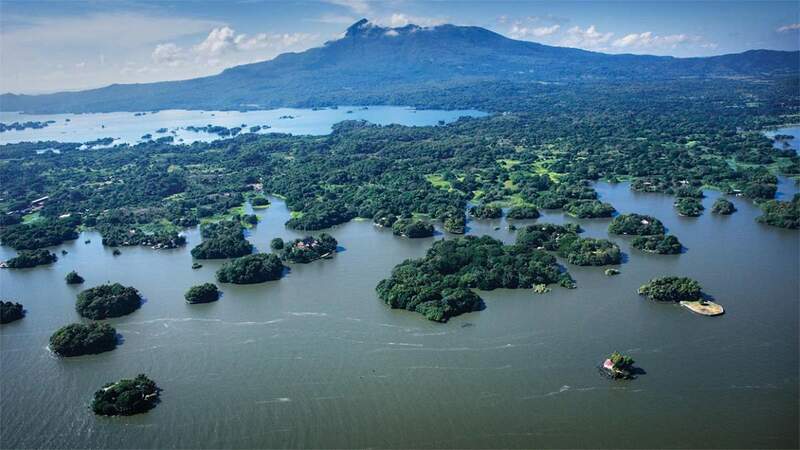 The islets of Granada (Spanish: Isletas de Granada) are located in Lake Nicaragua, just southeast of the city of Granada in Nicaragua. The islets are a group of 365 small islands scattered about the Asese Peninsula. The islets are of volcanic origin, they were formed when the Mombacho volcano blew much of its cone into the lake thousands of years ago, thereby creating the archipelago(2). Most of the islets are covered with vegetation and rich with bird life. Some islets are privately owned and hold homes or vacation houses. There are facilities for the residents and for tourists. Hotels and shops are established on some of the islets, and boating tours are available. 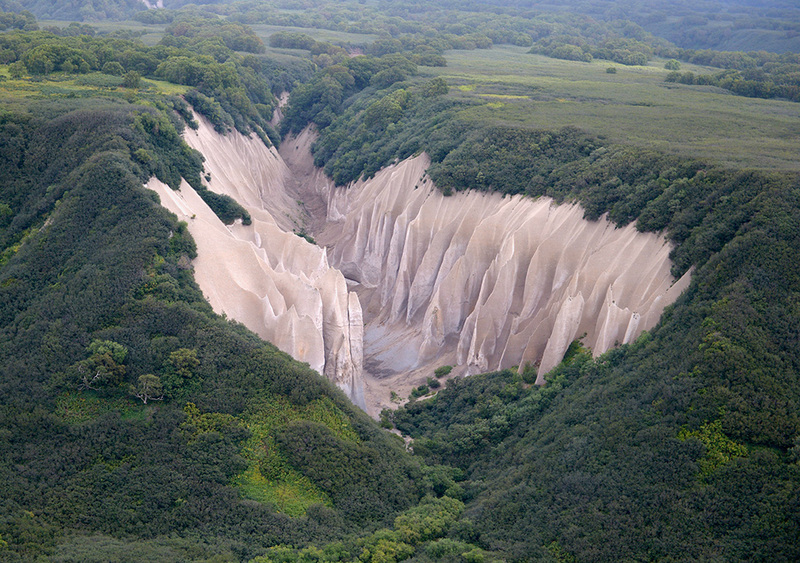 The Kuthiny Baty Valley has been formed about 8,000 years ago when a massive volcanic explosion shook the entire Kamchatka peninsula and an enormous amount of the ejected material created a thick layer of deposits all over the countryside. Subsequent erosion carved a spectacular valley scattered with obelisks that appear to resemble gigantic canoes standing upwards, which is where the name Kuthiny Baty comes from, as it means “standing boat” in Russian. Angel Falls (Spanish: Salto Ángel; Pemon language: Kerepakupai Vená, meaning “waterfall of the deepest place”, or Parakupá Vená, meaning “the fall from the highest point”) is a waterfall in Venezuela. It is the world’s highest uninterrupted waterfall, with a height of 979 meters (3,212 ft) and a plunge of 807 meters (2,648 ft). The waterfall drops over the edge of the Auyantepui mountain in the Canaima National Park (Spanish: Parque Nacional Canaima), a UNESCO World Heritage site in the Gran Sabana region of Bolívar State. The height figure 979 meters (3,212 ft) mostly consists of the main plunge but also includes about 400 meters (0.25 mi) of sloped cascades and rapids below the drop and a 30-meter (98 ft) high plunge downstream of the talus rapids. The Pico Cão Grande (Great Dog Peak) is a landmark needle-shaped volcanic plug peak in São Tomé and Príncipe(3), in the south of São Tomé Island in Obo National Park. It rises dramatically over 300 m (1,000 ft) above the surrounding terrain and the summit is 663 m (2,175 ft) above sea level. 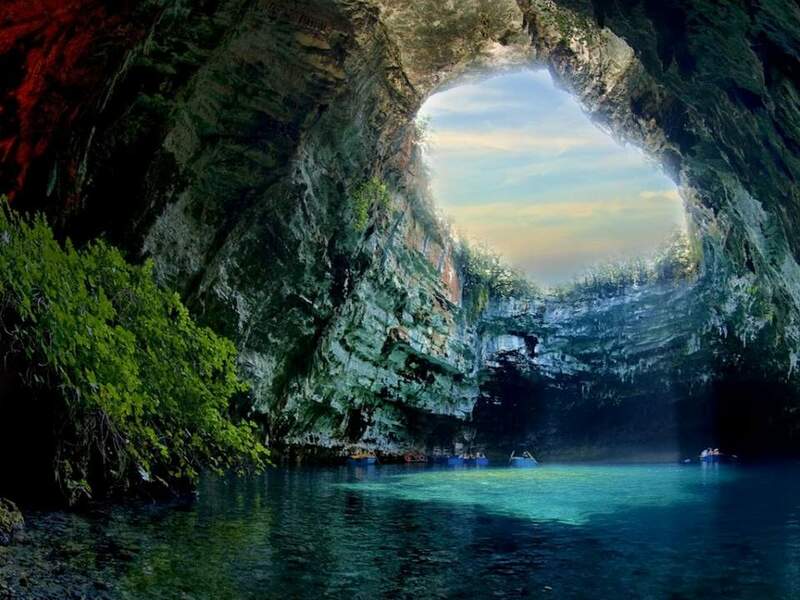 Melissani Cave or Melissani Lake, also Melisani is a cave located on the island of Kefalonia, northwest of Sami, about 5 km SE of Agia Efthymia, NE of Argostoli and NW of Poros. The Ionian Sea lies to the east with the Strait of Ithaca. Forests surround the cave and the mountain slope is to the west. Near the cave is the entry to the cave with parking lots and is passed almost in the middle of the main road linking Sami and Agia Efimia especially to the northern part of the island. In Greek mythology, Melissani was the Cave of the Nymphs. It features a lake surrounded with trees and forest and is located east of the mountains of Evmorfia and Agia Dynati. Tourism is common. The lake’s bottom is covered with stones. Plants grow at the opening of the cave. The color of the stone near the opening is stucco to honey-like brown. 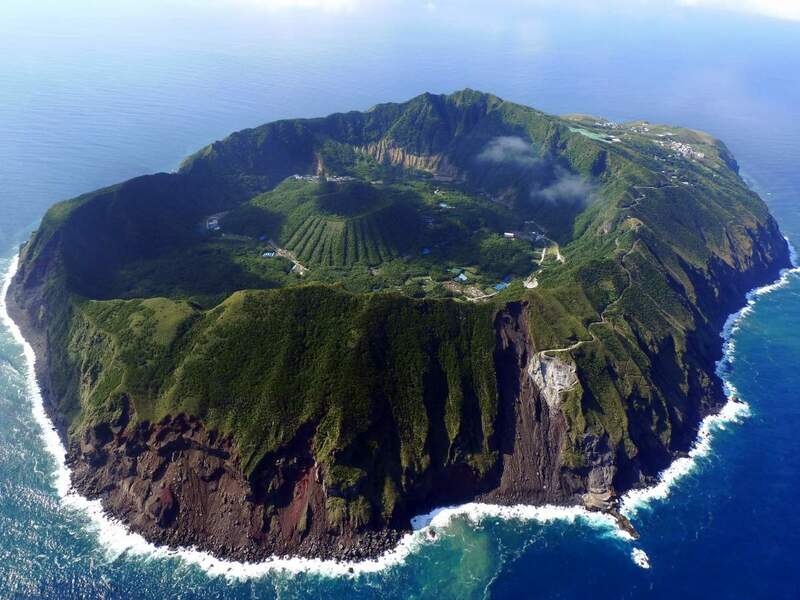 Still considered a Class-C active volcano by the Japan Meteorological Agency, the last eruption of Aogashima was during a four-year period from 1781–1785. Mitchell Falls is a very beautiful four-tiered waterfall in the remote Kimberley Region of Western Australia. Getting there is not that easy and the falls is only accessible by a 4WD or by helicopter. It is in the Mitchell River National Park, 2,140 kilometers (1,330 mi) northeast of Perth. Mauritius is an island nation 1,200 kilometers southeast of Africa. Like many ocean islands, there are fabulous reefs off the coast of Mauritius, living ecosystems that are fascinating in their own right. But unlike many of them, Mauritius, and indeed the entire land-and-seascape around it, is relatively very new on geological timescales. This oceanic shelf didn’t exist a few million years ago; sea-floor spreading created this plateau fairly recently. And there’s a huge drop-off when you leave the plateau! While most of the ocean waters around these islands is at depths ranging from 8-to-150 meters, there’s a huge plunge off that shelf into the ocean, where the depth drops to many thousands of meters. So, what looks like an underwater waterfall, is actually sand from the shores of Mauritius being driven via ocean currents off of that high, coastal shelf, and down into the darker ocean depths off the southern tip of the island. But it’s a really wonderful illusion. There is a strange phenomenon occurring on Mauritius’ southwestern tip: an illusion that looks as if there’s a waterfall flowing underneath the ocean. It was first seen through a satellite image via Google Earth. A phreatic eruption, also called a phreatic explosion, ultravulcanian eruption or steam-blast eruption, occurs when magma heats ground or surface water. The extreme temperature of the magma (anywhere from 500 to 1,170 °C (932 to 2,138 °F)) causes near-instantaneous evaporation to steam, resulting in an explosion of steam, water, ash, rock, and volcanic bombs. An archipelago, sometimes called an island group or island chain, is a chain, cluster or collection of islands. The word archipelago is derived from the Greek ἄρχι- – arkhi- (“chief”) and πέλαγος – pélagos (“sea”) through the Italian arcipelago. In Italian, possibly following a tradition of antiquity, the Arcipelago (from medieval Greek *ἀρχιπέλαγος and Latin archipelagus) was the proper name for the Aegean Sea and, later, usage shifted to refer to the Aegean Islands (since the sea is remarkable for its large number of islands). It is now used to refer to any island group or, sometimes, to a sea containing a small number of scattered islands. São Tomé and Príncipe, officially the Democratic Republic of São Tomé and Príncipe, is a Portuguese-speaking island nation in the Gulf of Guinea, off the western equatorial coast of Central Africa. It consists of two archipelagos around the two main islands: São Tomé and Príncipe, located about 140 kilometers (87 mi) apart and about 250 and 225 kilometres (155 and 140 mi), respectively, off the northwestern coast of Gabon.